Summer is going by too quickly. It is hard to believe that we have gone past the first week of August and Our Vegetable Garden will be winding down soon. 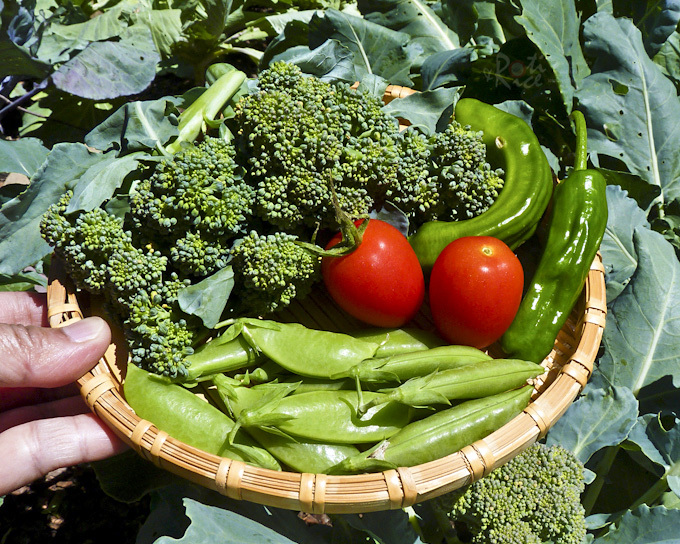 The garden has kept us busy but it has also rewarded us with some sweet homegrown vegetables. To date, we have harvested spring onions for our Sausage, Potato, and Egg Skillet, broccoli for this Broccoli, Cauliflower, and Sausage Stir Fry, peppers, a few tomatoes, and some herbs for this easy Pasta with Fresh Herbs, Sausage, and Tomatoes. There are lots more tomatoes on the vine and I am hoping that enough will ripen at the same time for me to make a salad with them. 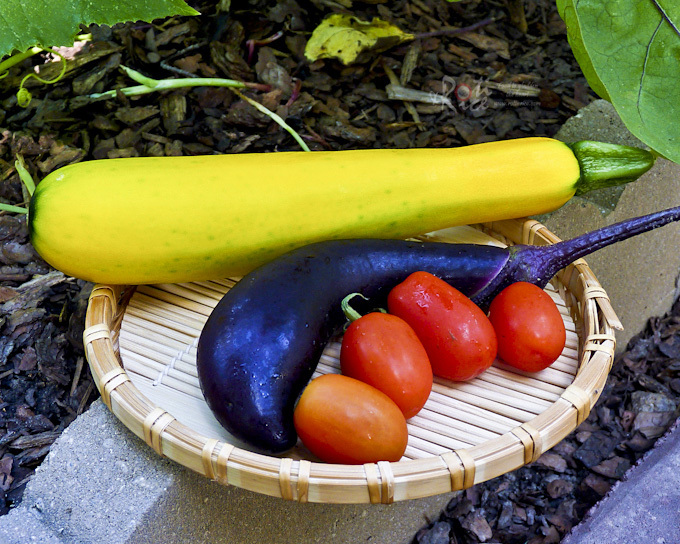 This past weekend, I managed to harvest a huge yellow squash, one Shikou eggplant, and a few more tomatoes. I see a few more small yellow squashes. Hopefully, they will grow quickly so that I can combine them to make a side dish soon. So far, the most prolific producers from our vegetable garden are the sugar snap pea vines. We have harvested close to 4 pounds of sugar snap peas in the past two months. The vines are now slowly drying up and there are just a few more peas left on them to mature into seed pods. 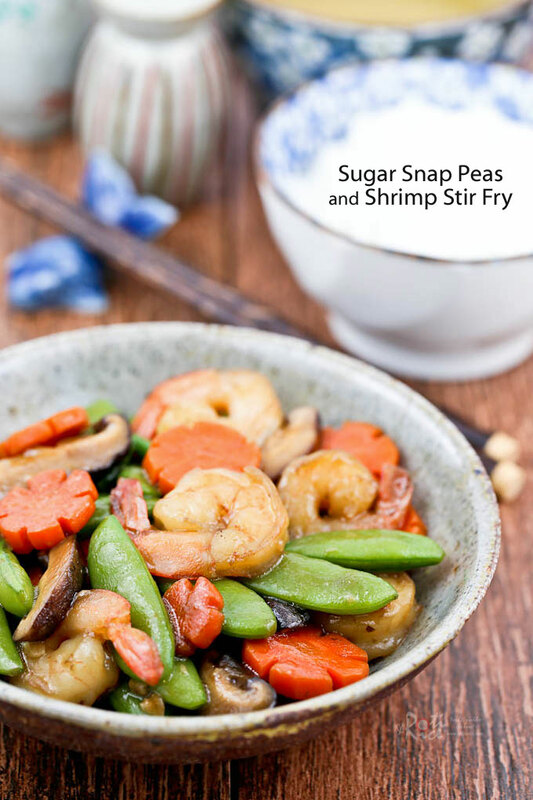 This quick and easy Sugar Snap Peas and Shrimps Stir Fry was cooked using the last 12 ounces of sugar snap peas from the garden. Both sons loved it so much I cooked this dish twice (the first time using sugar snap peas from the first harvest). 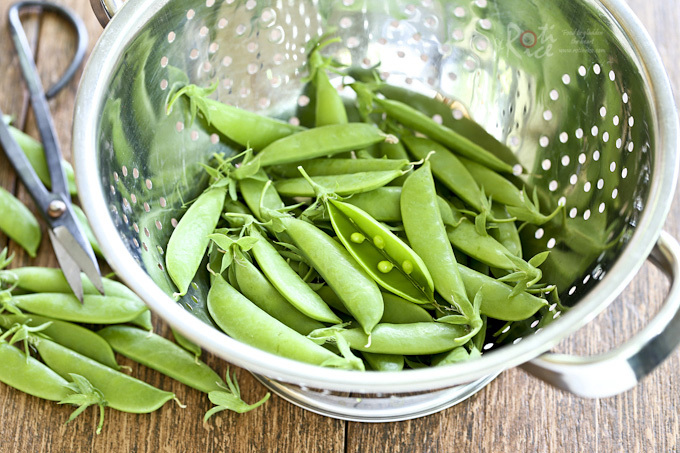 Sugar snap peas are sweet and mild and so they combine really well with seafood. Do also check out this Sugar Snap Peas and Squid Stir Fry posted about 3 weeks ago. I think it is just as tasty. Heat a wok or large fry pan. Add 1 tablespoon vegetable oil. Fry carrots and sugar snap peas for 2 minutes. Remove and set aside. 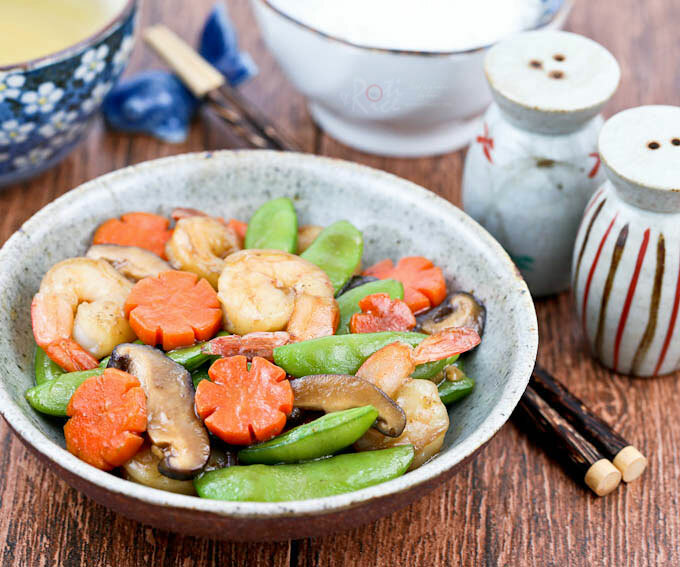 Add remaining 2 tablespoons vegetable oil to the wok. Fry garlic flakes for 30 seconds. Add mushrooms. Fry for 1 minute. Then add shrimps and continue to fry for another 2 to 3 minutes or until shrimps turn pink and curl. 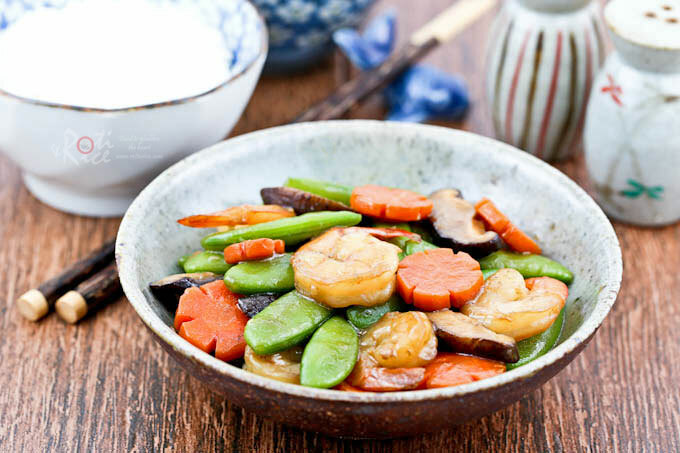 Return carrots and sugar snap peas to the wok. Add soy sauce, Shao Hsing cooking wine, and salt. Fry for another minute. We had this for dinner tonight with zucchini instead of mushrooms since we’re not big mushroom fans here. It was so good that it is sure to become a staple in our family. Thank you so much for sharing!